So you bought that Facebook stock and want to see how much your investment is worth today? Sorry, is it too soon?? Anyway for those of us who want to track our investments on the go, Portfolio Mobile has the solution. Primarily an iOS and Mac application they recently released an Android version. However, this review will focus on the iOS version. Portfolio Mobile is a stock portfolio tracking solution which gives you real time access to your investments including stocks, bonds, money markets, options, and insurance policies. Regardless of what version you use, they will sync with each other. So what you do on your Mac will be in sync with your iPad. Using more than 6 different sources for online quotes, Portfolio Mobile shows you real time P&L and value calculations of your actual position. That’s nice to have on the go and can end up saving you a ton of money on a diving stock. World coverage with quotes from Bloomberg, Euronext, Google, MSN, Yahoo and more. 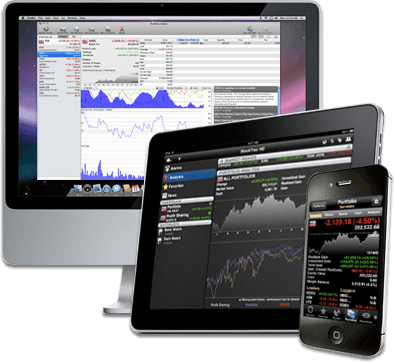 Automatic conversion between stock trading currencies and your native currencies. Visualize stock, portfolio and aggregate P&L and value across in numeric and charted representations. News from any RSS-compatible news source. With it’s latest update, the iOS version adds many improvements to various charting features. The price varies according to what platform you want. The Android version is free, while the lite version will cost you $2.99 on the iPad and $0.99 on the iPhone. The Pro version for iOS is $9.99.